In the wake of Intel's launch of its Core-X Series CPUs Gigabyte is among the first to announce a range of Intel X299 chipset motherboards. 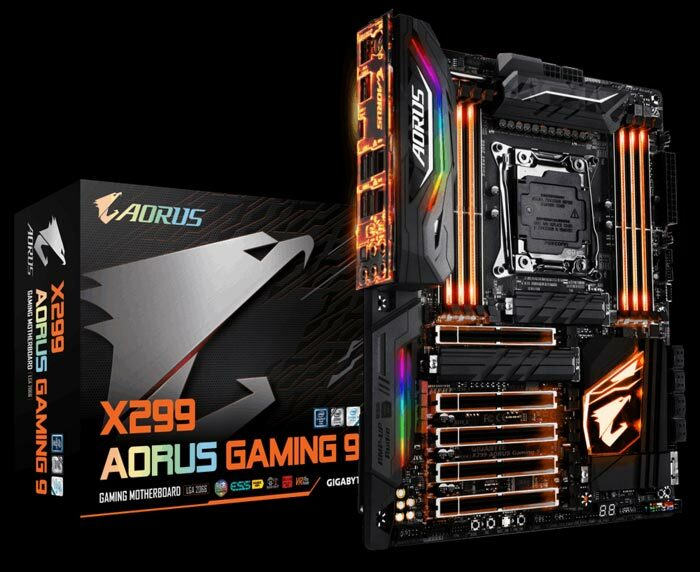 Gigabyte's newest motherboard products are likely to be similar to a raft of X299 releases from rivals such as Asus, MSI, ASRock and others, so let's have a look at what the new X299 AORUS Gaming 9, X299 AORUS Gaming 7, and X299 AORUS Gaming 3 motherboards bring to the desktop (quickly compare all three of these ATX boards). 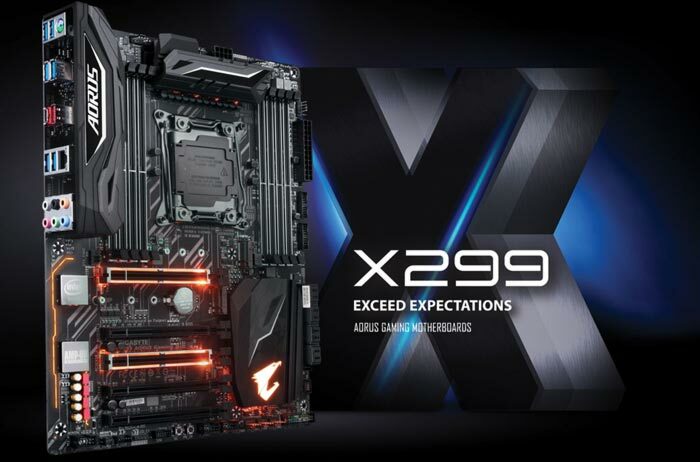 Talking in general about the new range, Gigabyte boasts that the X299 series offers improvements over their predecessors that include; ESS Sabre audio and ASmedia ASM3142 USB 3.1, RGB Fusion with Digital LEDs, Smart Fan 5 with Fan Stop, and M.2 support. Add to the above redesigned black armour and a black PCB for a new look. Gigabyte has reinforced the X299 Gaming series PCBs to reduce any strain effects from powerful and heavy graphics cards, coolers, and so on. Gigabyte has partnered with WTFast to leverage the WTFast Gamers Private Network (GPN), which can optimize and improve connections from a gamers' home PC to the game server and back again. It is claimed to deliver up to 60 per cent overall connection improvement with reduced ping times and so on. RGB LED lighting is present with Gigabyte's RGB Fusion plus onboard LEDs. The new Gaming 9 and 7 models boast these features with up to 8 lighting patterns and individually addressable LEDs plus support for 5v/12v lighting strips via the Digital LED headers. Smart Fan 5 with Fan Stop technology features throughout the range. As it sounds, Fan Stop technology prevents fans from spinning under a certain temperature threshold. Smart Fan 5 is said to provide complete control over fans, liquid coolers, and the monitoring of this equipment. Triple M.2. support is a key feature of these new boards. Intel Optane is of course supported too. Whatever you use the M.2 slot for, Gigabyte says its M.2 Thermal Guard will prevent throttling bottlenecks that could be caused by overheating. 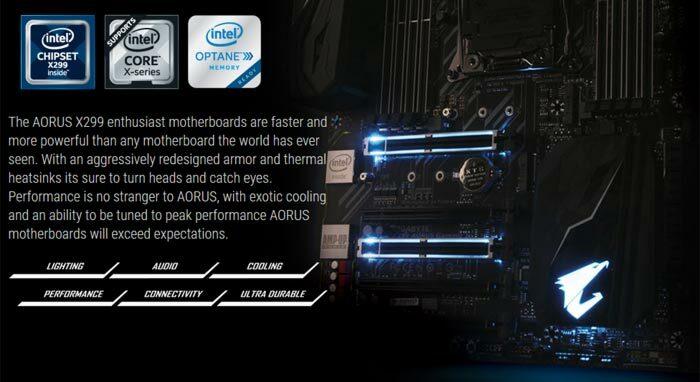 Last but not least in the highlighted new features list, Gigabyte boasts of a high-fidelity audio experience with its new X299 Aorus Gaming boards. For example, the new Gaming 9 and 7 models equip an ESS Sabre DAC, capable of 127dB, plus on-board support for up to 7.1 speaker setups and digital outputs. For the full tech specs list of the individual motherboards and for comparative specs lists please check the links in the intro paragraph. Gigabyte says its X299 Series motherboards will be available for purchase from June. Intel Xeon W-3175X processor released, costs $2,999 MSI MPG Z390I Gaming Edge AC gains 5.6GHz DDR4 world record Nvidia partners detail their GeForce GTX 1650 graphics cards Intel Core i5-9400 QOTW: What wattage is your power supply? Is RGB mobo. Can set it to any colour(s) you want, no?